After completing a 7-hour editing spree for my report which is due in less than 48 hours, I decided to take a little trip to Port Coquitlam for some sushi. 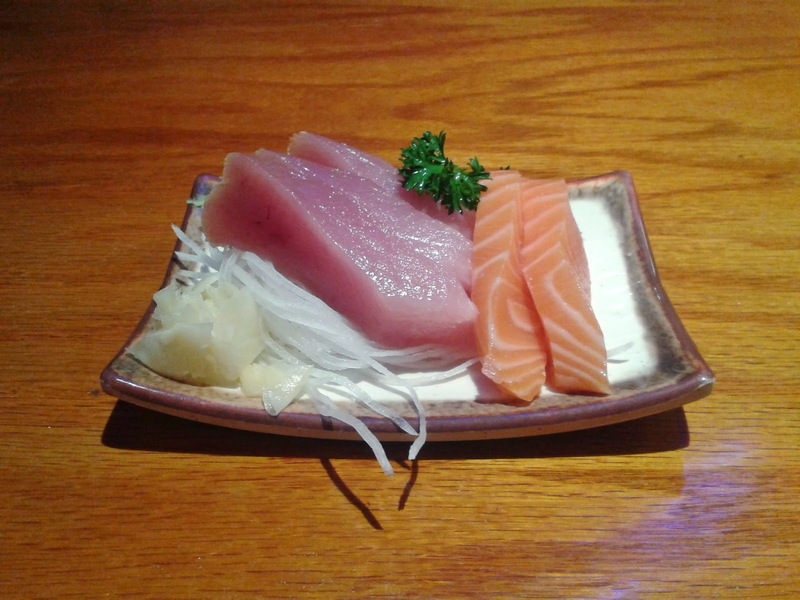 Asahi Japanese Restaurant is located in the corner of a small plaza in the southeastern corner of downtown Port Coquitlam, close to the Port Coquitlam West Coast Express station. As I walked into the restaurant, I was quite surprised by how big the restaurant actually was. There were at least 15 tables, each of which can seat 4 or more people. Some of these tables were housed in small private tatami rooms. Right away, I could sense that service was one of the priorities of the restaurant. I was seated promptly, and received apologies for even the slightest of errors, such as taking a few seconds longer to walk to my table to take my order. The servers were literally running (or at least doing a quick shuffle) constantly, trying to get all the food to the diners as quickly as possible. 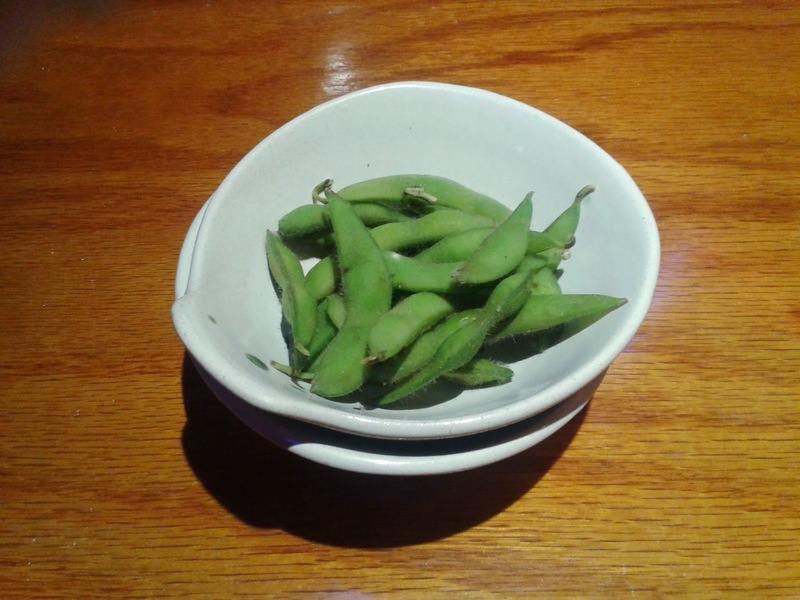 Wow, I even got a complimentary Edamame (soybeans) to start off my meal while I was waiting for my food. I enjoyed the cashew-like flavour of the beans, and although they were a bit dry, I could easily pop them into my mouth. At $1.25, this was some of the most inexpensive Yakitori I have ever had. 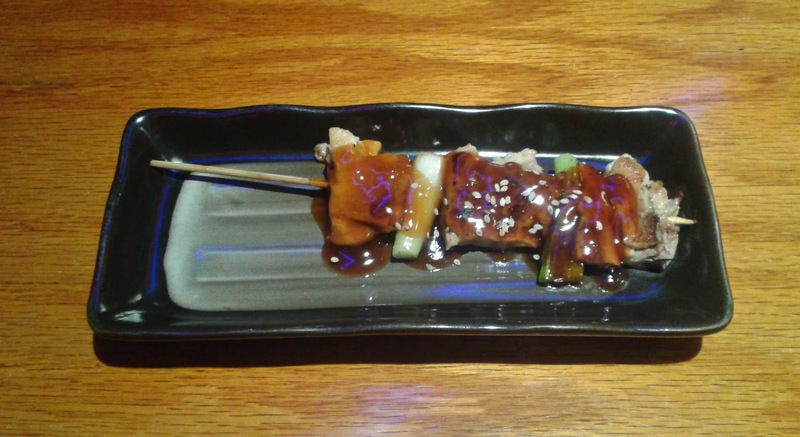 The sauce was especially savoury and the leeks provided juiciness to this carefully prepared skewer. The chicken was not tough, but it would be nice if they let the sauce seep into the chicken a little more. Just as I finished the Yakitori, I received the Starter Sashimi, which came with 3 pieces of tuna and 2 pieces of salmon. The Salmon Sashimi was not only fresh, but also had a soft texture without being fatty. The Tuna Sashimi also had a perfectly soft texture, but was quite bland, and this was especially noticeable in the absence of soy sauce. 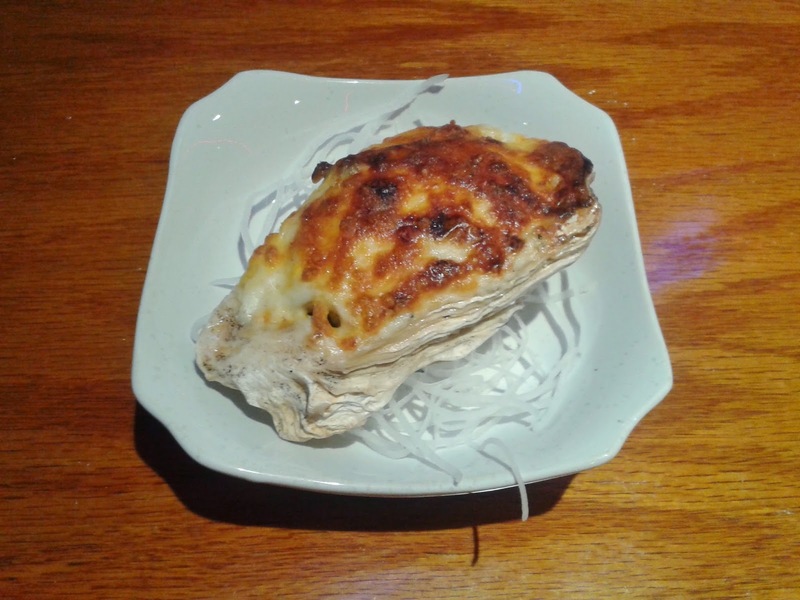 The Oyster Motoyaki came with quite a bit of oyster - about two or three large ones to be precise. The tasty oysters were the prominent feature in terms of taste, and the custard surrounding them was a bit thick, being almost sticky. Of particular interest is the layer of cheese on top of the motoyaki. It was quite crispy, and was almost an exact replica of the cheese layer found on a pizza. Next, the three different kinds of rolls I ordered came all on the same dish. Oh my, that's a lot of sushi! Asahi does provide half orders on special rolls, but when they came, it was evident that "two-thirds orders" was a more accurate term to describe the sushi. Each of the "half orders" of special rolls I ordered came with 6 pieces instead of the regular 9 pieces. 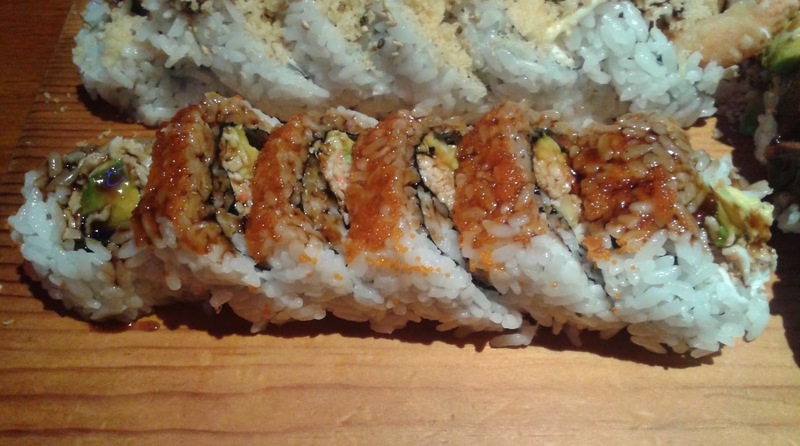 The prices of each of the special rolls ended up being about two-thirds of the regular price as well. The description next to the BC Roll said "grilled salmon skin". This was not listed as a special roll, but clearly, it is equally elaborate compared to the rolls in the Special Rolls section. In addition to grilled salmon skin, there was avocado, cucumber, crab meat, masago and teriyaki sauce. The teriyaki sauce was drizzled quite evenly over the roll and successfully amplified the harmony of crab meat and avocado. There was slightly more salmon meat than salmon skin, and although the skin was not crispy per se, the salmon itself was tastefully grilled. 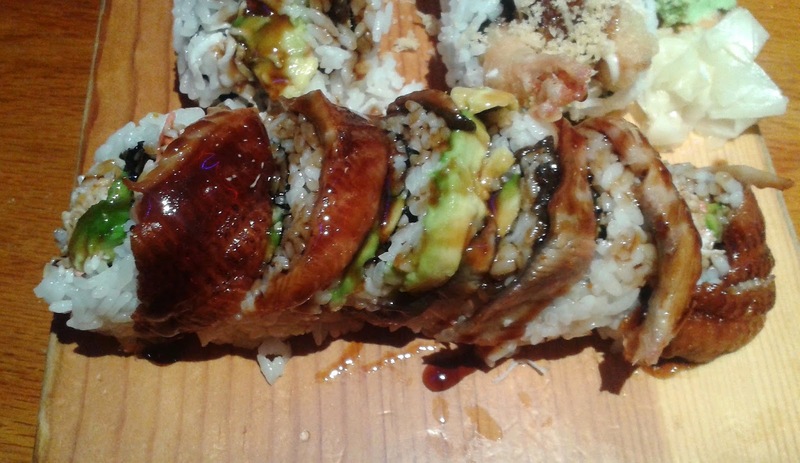 The half order Dragon Roll came with 6 pieces containing crab meat, avocado, and cucumber with barbequed eel, avocado and unagi sauce on the outside. Unfortunately, the eel on top was a little dry and under-seasoned, even though the rest of the roll contained the right amount of moisture. The crab meat had a good amount of mayonnaise and went well with the avocado. The Dragon Roll was remarkably similar to the BC Roll, but was not as well executed as the BC Roll, considering the choice of ingredients. 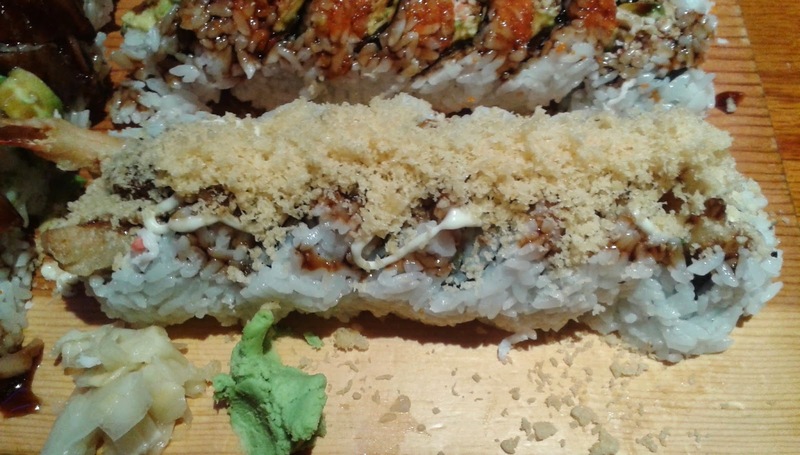 The half order Crispy Crunch Roll consisted of 2 pieces of prawn tempura, yam tempura, crab meat, cucumber, crispy crumbs, mayonnaise and unagi sauce. The crispy crumbs were ground very finely and provided a soft and crispy topping to the roll. 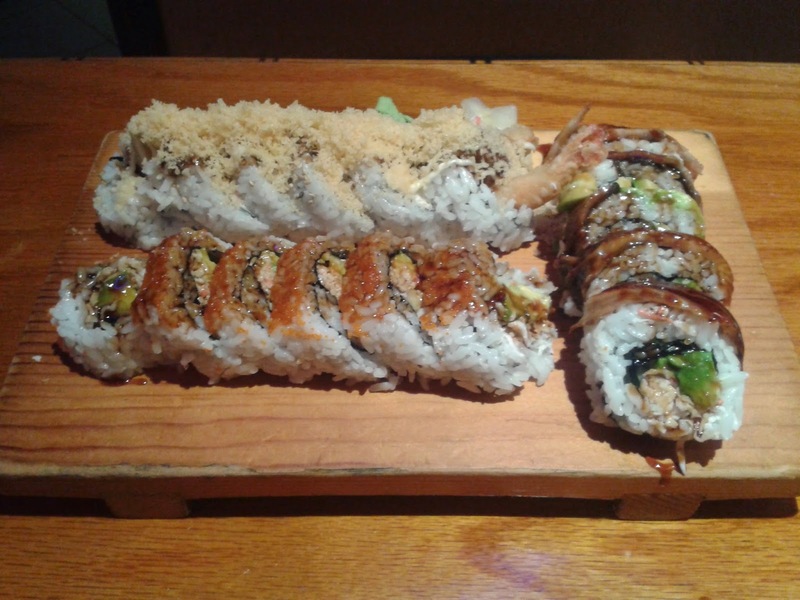 The roll itself was a little dry and the tempura prawn was overshadowed by the sweet yam tempura, giving the roll a sweet taste overall. The other issue was that the unagi sauce was too strong and didn't go very well with the tempura yam (one being very savoury, the other being very sweet), which resulted in a clash of flavours.